And the work has been uncovering some unexpected results, according to a spokesman from Dartmoor National Park Authority (DNPA). "The study tells us that from 9,500 BC until the early Bronze Age, the landscape of Dartmoor was different to the peat-covered moors that we are so familiar with today – instead, a mosaic landscape composed of bog and dry land was more recognisable for the prehistoric inhabitants of Dartmoor. "This effectively confirms the likelihood of archaeological remains surviving both beneath the peat and also within it," said the spokesman. "Pollen analysis has also revealed that the uplands were dominated by hazel woodland from the Late Mesolithic until the Late Iron Age (second half of the first century BC), when there was a shift to a more open, grass-dominated landscape." Dr Fyfe's palaeoecological survey has been able to establish such facts thanks to Ground Penetrating Radar (GPR). Samples extending down to the base of the peat, known as cores, were extracted at two sites and radiocarbon-dated to establish the exact time at which the bog started to form. The pollen found within the peat cores was examined and used to build a picture of past climatic conditions on northern Dartmoor. Meanwhile, Dr Newman's investigation of domestic and industrial peat cutting on northern Dartmoor has provided the most recent and extensive study on the subject. The study researched industrial peat cutting sites at Blackabrook, Walkham Head and Rattlebrook and examined the historical evidence, including turf extraction techniques and tools. Nicola Rohan, DNPA's historic environment officer, said: "The peat-cutting heritage is often overshadowed by other aspects of Dartmoor's industrial past, but Dr Newman has shed light on a fascinating subject that has impacted upon the landscape since at least the 13th century AD. 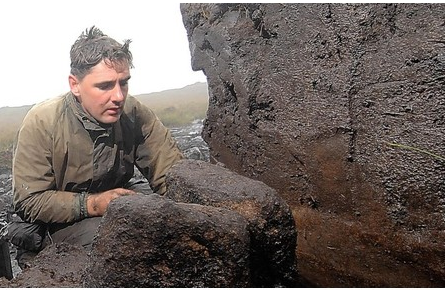 "Similarly, Dr Fyfe's work has illustrated the incredible value of peat as an archive, which will be compromised if our mires continue to erode." Restoration works started in September 2011 are being continued this autumn – the surveys were made possible thanks to funding from Natural England, facilitated by the trustees of the Forest of Dartmoor Environmentally Sensitive Area Scheme.